Acupuncture for OAB: Is Acupuncture an Effective Tool for Your Treatment? If you have OAB, there is hope. 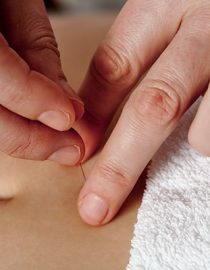 You may not know that acupuncture is a potential treatment for this condition, and that it has had significant success. In fact, acupuncture has been reported as a successful treatment for Overactive Bladder symptoms since the 1980s. The muscles that regulate urination are controlled by two parts of the nervous system, the autonomic and the somatic nervous systems. For example, the detrusor muscle needs sympathetic nervous system stimulation (from the spinal nerves T11 to L2) to relax, and the spinal nerves S2 to S4 to contract, which occurs via parasympathetic stimulation. The somatic system controls the external urethral sphincter. Both parts of the nervous system must work for an individual to have control of their bladder. Acupuncture can address both of these parts of the nervous system. The Department of Obstetrics and Gynecology at Oregon Health and Science University in Portland verified the hypothesis that acupuncture could successfully treat women who experienced OAB. The study appeared in ‘Obstetrics and Gynecology’ in 2005. Researchers placed eighty-five women randomly in either an acupuncture group or a placebo acupuncture group. The placebo treatment allowed the subjects to relax, but did not include any of the pertinent acupuncture points that might help treat urinary incontinence. The treatments went on for four weeks. All women have been victims of Overactive Bladder, and they were most certainly fed up of living with the condition. The subjects completed questionnaires about the ways that incontinence was affecting their lives, and also had to keep a diary of the instances in which they urinated. The researchers were looking for the number of incontinent episodes within a 72-hour period of time. The researchers also sought to determine how urgent the call was to urinate, how often the subjects urinated, how much their bladders could hold, and the maximum amount the subjects urinated. Both groups of women showed significant decreases in the number of episodes of incontinence; the acupuncture group demonstrated a 59% decrease and the placebo showed a 40% decrease in episode of incontinence. There were significant differences between the groups; those who had acupuncture went to urinate 14% less than they had previously, and increased the maximum voided volume and bladder capacity by 13%. They also showed a 30% reduction in the proportion of voids associated with urgency. Both groups improved their scores pertaining to urinary distress and how incontinence affected their lives. For the acupuncture group, the improvement was 54% compared to 30%. Acupuncture treatment for OAB always depends on the needs of the individual patient, but usually, the points are selected from the kidney, bladder and spleen meridians. In one MRI study, activating this point stimulated the hypothalamus and prefrontal cortex, thereby increasing serotonin; this justification lies at the core of the thought that acupuncture has a positive effect on Overactive Bladder. Located at the low border of the L2 level of the spinous process on the back, one and a half finger widths lateral, this point is important for the urination center. It is also helpful for the parasympathetic nerve supply to the bladder. Located on the back, at the level of the second sacral foramina in the paravertebral muscles, 1-1/2 finger widths lateral to the midline. This point is located in the midline, about three finger widths underneath the belly button and two finger widths above the pubic bone. Above the first sacral foramina on the back, this point is good for the parasympathetic innervation of the bladder. This point also corresponds to the origin of the somatic fibers of the pudendal nerve; this supplies the pelvic floor muscles and the sphincter in the contracted state. This point is above the second sacral foramina on the back. It is important for parasympathetic innervation of the bladder. This point is above the third sacral foramina on the back. It is important for parasympathetic innervation of the bladder. The Kidney 13 and Spleen 6 acupuncture points are often used to treat OAB, and other points could be added. You can stimulate these points yourself by holding each one for about a minute. Emmons, S.L. and Otto, L. Acupuncture for overactive bladder: a randomized controlled trial. Obstet Gynecol 2005 Jul; 106 (1): 138-43. Paik, Sun-ho, et al. Acupuncture for the treatment of urinary incontinence: A review of randomized controlled trials. Exp Ther Med Sep 2013; 6 (3): 773-780. You might also like...Can a Chiropractor Help OAB?